ISLAMABAD, Oct 25 (APP):A joint painting exhibition by a renowned painter and Pakistani Artist Akram Dost and French artist Bertrand Bellon was held in Paris this week. 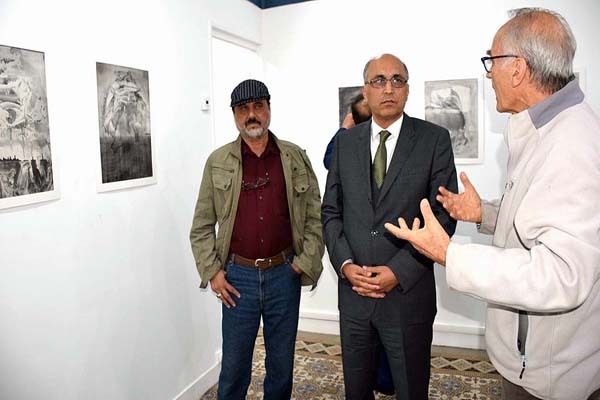 According to message received here, Ambassador of Pakistan to France Moin ul Haque visited the joint exhibition and praised the two artists for their original work. He appreciated them for jointly exploring the commonalities of cultural and artistic values of Pakistan and France. Akram Dost who is a renowned painter of Pakistan hailing from Balochistan has successfully been exhibiting his art work in Paris along with Bertrand Bellon of France in the past as well.